Rosneft suspended an oil project in the Yuzhno-Chernomorsky area of the Black Sea due to western sanctions. Rosneft had partnered with Exxon-Mobil and Eni a few years ago to work on joint-exploration projects in the Black Sea and other areas. While US sanctions block Exxon from working with Rosneft, the EU version of the sanctions includes a grandfather clause for existing projects, which has allowed Eni to continue working with Rosneft. Western sanctions have forced Russian oil behemoth Rosneft to suspend an oil project in the Black Sea. Russia’s Federal Subsurface Management Agency (Rosnedra) suspended Rosneft’s licence for the exploration and production of oil and gas in the Yuzhno-Chernomorksy area of the Black Sea for five years because of western sanctions, a source told RBC. Russian state media TASS later reported the suspension, as well. A representative from Rosneft said that the suspension was prompted by the “adverse macroeconomic situation and sanctions,” as well as by a lack of drilling equipment. The company will “keep an eye on changes in the macroeconomic parameters,” TASS said. But the Russian oil giant plans to continue drilling in the Zapadno-Chernomorsky area of the Black Sea and will soon begin drilling an appraisal well with Italian oil multinational Eni SpA, according to the Rosneft representative. Energy exports are the backbone and muscle of the Russian economy, and Moscow has long been keen to develop some of its nonporous fields, which are difficult to tap with traditional drilling techniques. But Russia doesn’t have the technological capability to work in those regions alone. So, Rosneft teamed up with Exxon-Mobil Corp. and Eni for joint exploration projects in several regions, including the Black Sea and the Arctic. Some of those exploration plans hit a brick a brick wall several years later, however, after western sanctions were imposed on Russia in response to its actions in Ukraine. While Exxon has had to pull out of its partnership with Rosneft, the EU version of the sanctions on Russia is slightly different from the US’s in that there’s a grandfather clause for existing projects. This has allowed Italian oil company Eni to continue its venture in the Russian sector of the Black Sea. A source told the Wall Street Journal back in April 2017 that “Exxon is worried it could get boxed out of the Black Sea by the Italians.” Meanwhile, Eni and Rosneft signed an extension cooperation agreement in the areas of upstream, refining, marketing, and trading in May 2017. Rosneft and Exxon signed a landmark deal in 2012 under then-Exxon CEO and current Secretary of State Rex Tillerson’s leadership to explore Russia’s arctic and its portion of the Black Sea, as well as drill in Siberia. Rosneft signed another deal with Eni two weeks later. The Obama administration issued an executive order that imposed sanctions on Russia in response to the country’s actions in Ukraine in 2014. Part of the sanctions leveled on Russia include the prohibition of technology transfers in Russian energy projects in the Arctic, Siberia, and the Black Sea. Sanctions also prohibit dealings with Rosneft CEO Igor Sechin. 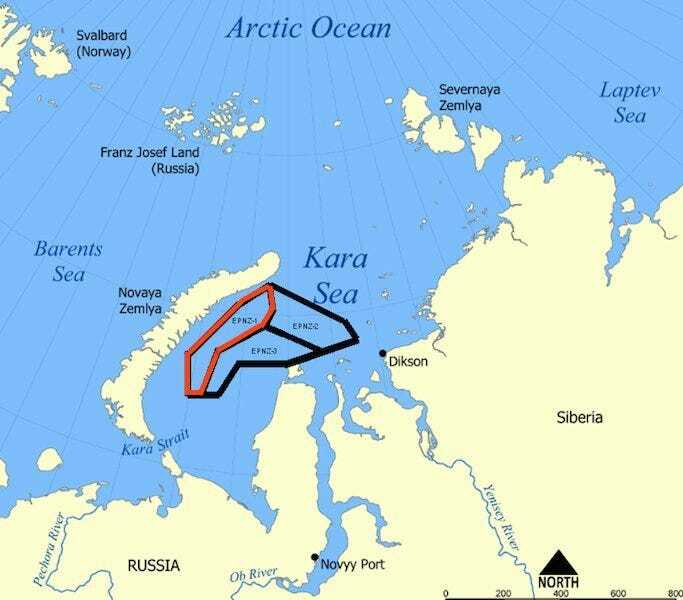 WikimediaThe red area is where Rosneft said it found oil. One key casualty of that round of sanctions was the Kara Sea inside the Arctic Circle. In September 2014, Rosneft discovered oil there with Exxon but, due to the sanctions, they could not continue the landmark joint exploration. This proved to be problematic for both parties since Rosneft does not have the technological ability to drill in cold offshore conditions by itself, while Russia was Exxon’s second-biggest exploration area at the time. US President Donald Trump advocated improving relations with Russia over the course of his campaign. However, the prospects of improving relations between the two countries began to fade over the course of 2017 following a US strike on Syria and the launching of an investigation into whether there were ties between Trump aides and Russia by Congress. And after it emerged in April 2017 that Exxon applied to the Treasury Department in 2015 for a waiver of sanctions restrictions, the Treasury swiftly released a statement saying it won’t issue waivers to US companies, including Exxon, to work in Russia.